Dolce Vita - Romantic Holidays South Tyrol: the Dolce Vita Hotels provide a romantic holiday residence for you and your sweetheart to spend fantastic holidays together in Italy. Packages and treatments for couples will make your blissful holidays even sweeter. Romantic Holidays in South Tyrol: follow your heart and treat yourself to a romantic break with your partner at a cosy Dolce Vita Hotel. There are plenty of opportunities to make your dreams come true at the romantic Dolce Vita Hotels in Italy. Your lovingly appointed rooms and the amenities of the extensive wellness and spa areas will spirit you away to a world of well-being. Spend wonderful hours with your love at the romantic hotels in South Tyrol. Leave daily life behind and take some time for tenderness and indulgence. The way to your partner's heart is through their stomach: candle light, a tender glance, culinary delights and an excellent wine - treat yourself to culinary indulgence and romantic moments during your romantic holidays in South Tyrol. Hotel Preidlhof, your romantic hotel in South Tyrol, is the ideal nest for love-birds looking for relaxation. Enjoy the stunning view: an extensive Mediterranean park with more than 1000 cypress, palm and olive trees surround the picturesque hotel. Enjoy a stroll through the beautiful landscape with your sweetheart and enjoy the peace and tranquility together. Hotel Preidlhof has a soft spot for lovers and provides special offers for couples from December to April. A small piece of paradise for your love and you: Dolce Vita Hotel Paradies. 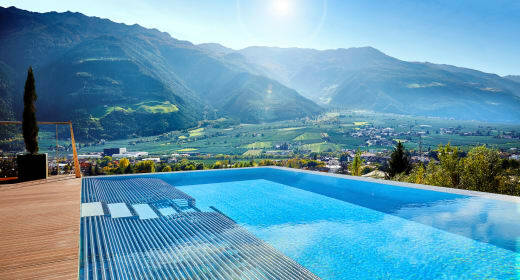 Enjoy romantic holidays in South Tyrol at the heart of fragrant orchards in a haven of luxury. Your romantic holiday is the opportunity to take some time for yourself and your sweetheart - time, what a precious gift. Romantic holidays in South Tyrol - enjoy a romantic ride in the Dolce Vita Convertible. 200 castles and palaces are in the close vicinity of your Dolce Vita Hotel, treat yourself to a stroll through the romantic alleys of Blozano and enjoy a cup of cappuccino with your sweetheart. Venture on a hiking tour through the idyllic, snow covered forests in winter or a helicopter flight high above the sparkling summits. Float on cloud nine in South Tyrol. Bookable in addition to the Dolce Vita half board. Here you can find the romantic packages of the Dolce Vita hotels.